It’s a few weeks into the New Year and I am sure you’ve made a few resolutions. Let’s see, the list probably includes losing weight, getting fit, making wiser food choices and saving money. Those are great resolutions and worthy of being on everyone’s list. I’d like to challenge you to add another one to your list – cook fearlessly. Get in the kitchen. Make your own food. Try a new recipe. Re-image an old recipe. Incorporate a new ingredient. Try a food hack. Bust out of your culinary comfort zone. Here’s a bit of a food hack that can jump start your fearless foray. Its a pretty bold move, but you can do it! I love those spicy peel and eat, New Orleans style shrimp bowls. You probably have a favorite restaurant where you like to enjoy the tasty crustaceans. I live in Los Angeles and one of my favorite restaurants to visit is Killer Shrimp in Marina Del Rey. 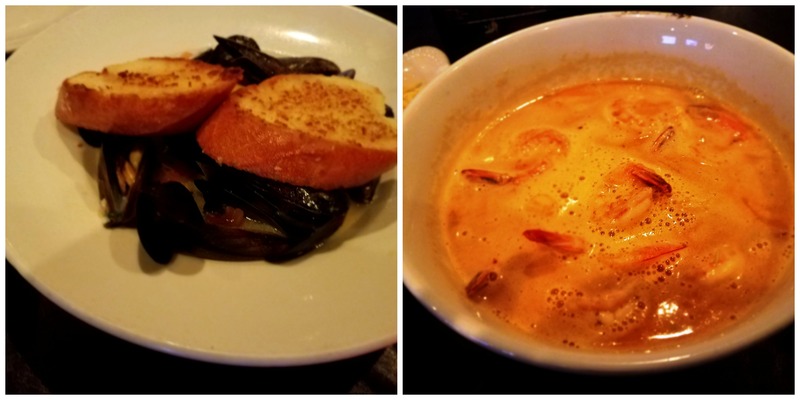 The shrimp and steamed mussel bowls are amazing. They are served with a basket of sour dough bread for dipping and sopping up all that tasty, luxurious, spicy broth. Both are absolutely delicious. 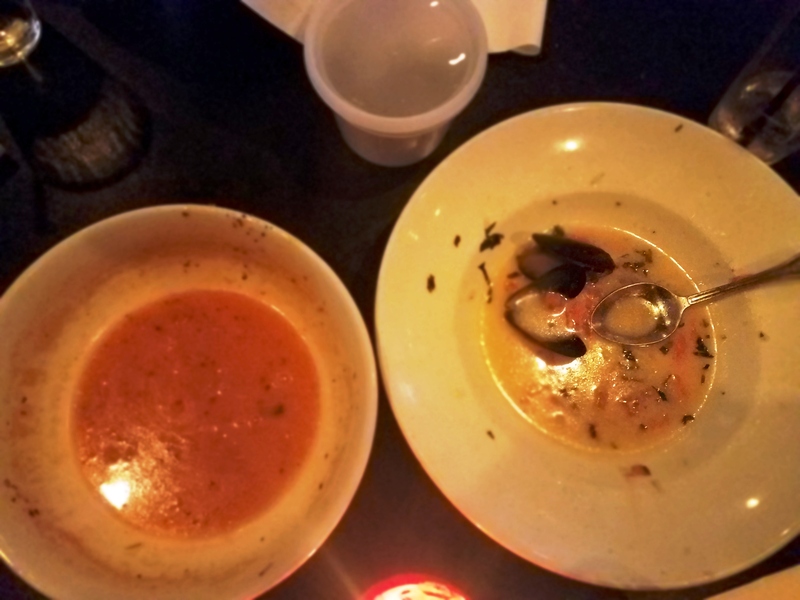 When I’ve eaten all the shrimp and mussels out of the bowls, what remains is a lovely broth that most people just leave to be discarded. But not me. I have my server combine the broth into one take home container which I stash in the freezer. Why? 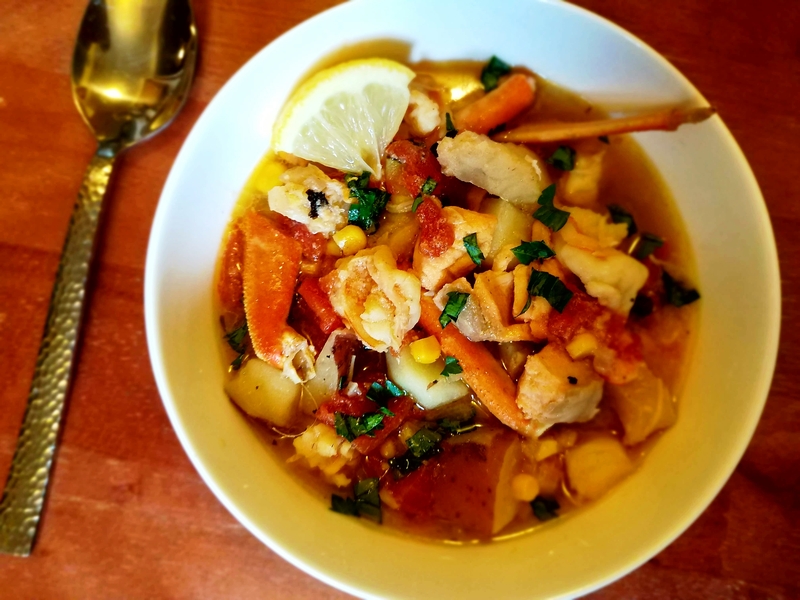 Because this favor infused broth is a great base for seafood chowder. What if you don’t have the tasty broth? No worries, you can substitute a combination of El Pato Jalapeno Salsa and Mexican beer to your taste. 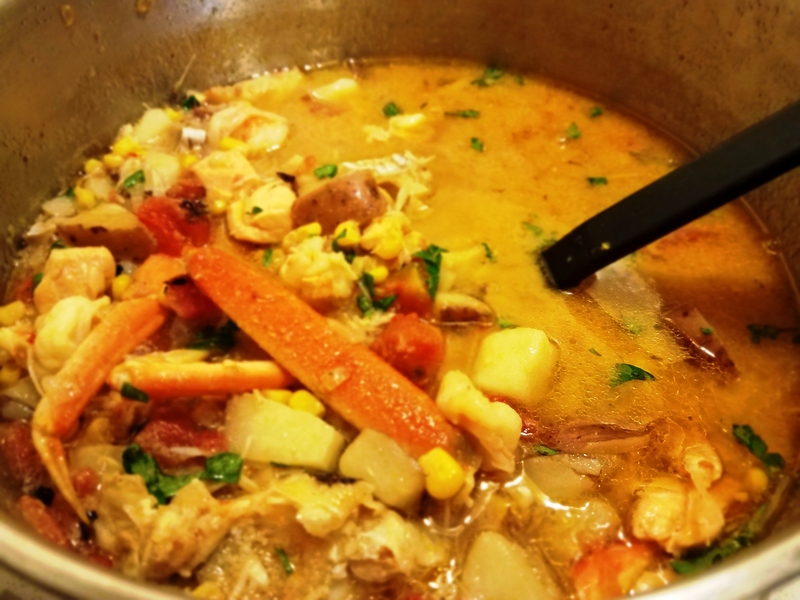 I’ve made this chowder often and my family and friends love it. This recipe has a delectable flavor and an impressive presentation. It looks like you worked in the kitchen all day. You can add any seafood you like. For this version, I rendered the fat from bacon and used the fat in making the roux. I also the crumbled bacon and added it to the stock pot along with the seafood. I used whole kernel corn. If you like, you can experiment with using creamed corn, sweet peas, celery or even chayote squash. This is a great recipe to experiment with because it’s very forgiving and lends itself to improvisation. After all, it’s just a gloried soup! So don’t be squeamish, be fearless. Give it a try and dazzle the loved ones in your life, or dazzle yourself. I am gently nudging you to cook fearlessly and eat well this year my friends. And you are very welcomed. Happy New Year and may you have sweet mornings, tasty afternoons and delicious evenings. Now – get cooking! Add butter to a pan set on medium heat. Add flour. When butter is melted, stir mixture until it is medium in color, about 3 minutes. Add chopped shallots and garlic to pan. Stir another 2 minutes. Remove pan, and empty mixture into a large Dutch oven or 5 quart stock pot. Option:Or you can do this step in large Dutch oven or 5 quart stock pan if you like. 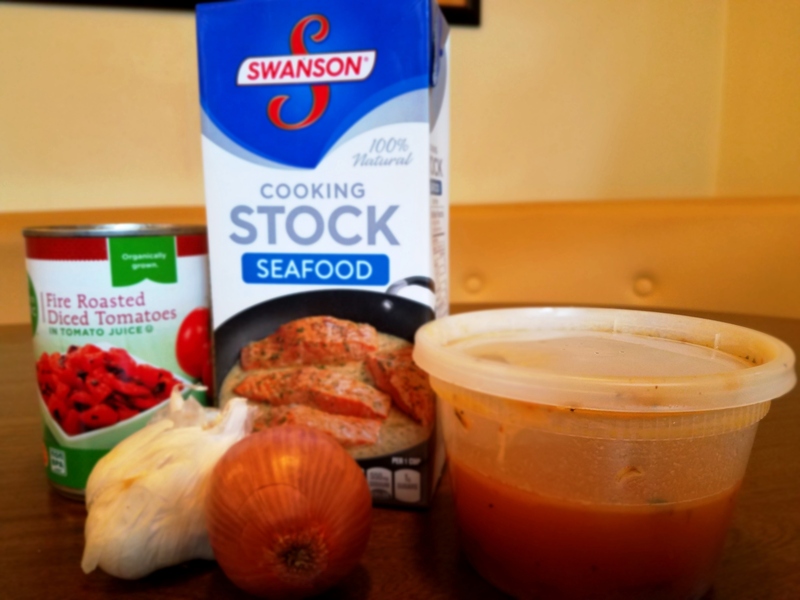 Add Killer Shrimp reserved broth (defrosted) , seafood cooking stock, diced fired roasted tomatoes and diced red potatoes to pot with browned flour, butter, shallots and onion roux mixture. Stir well. 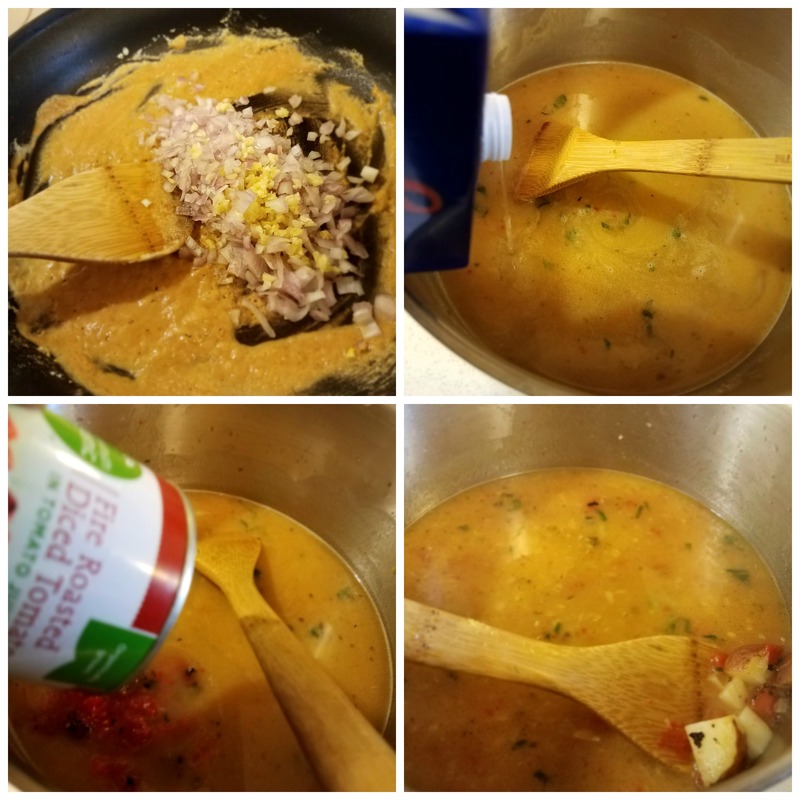 Left top: Add garlic and shallots to roux. Right top: Add Killer Shrimp broth and seafood cooking stock. Left bottom: Add diced, fire roasted tomatoes. Bottom right: Add diced, red potatoes. Bring to a gentle boil, turn down heat and simmer for 30 minutes on low heat. After 30 minutes, add seafood and whole kernel corn. Left: Add whole kernel sweet corn. Center: Add seafood (shrimp, Alaskan cod, salmon – crab legs are optional). Add ½ to 1 cup of additional stock if needed. Cover and simmer 15 to 20 minutes or until seafood is done. Garnish with fresh chopped parsley and lemon wedges.